Your Cart: 0 itemitems, $0.00 total. Looking to purchase a gift? Kits are a great gift--they can be built together with friends or family, and provide a feeling of accomplishment when they're done. This gift guide highlights a few great options if you're overwhelmed by options. We just released a series of products that combine LEGO MINDSTORMS NXT with Arduino. You can combine the sensors and motors and make your own creations, but using Arduino instead of the NXT brick. 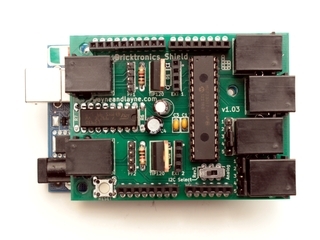 We've got a Bricktronics Shield Kit, which is a through-hole soldering kit, but we also have assembled kits available for purchase. 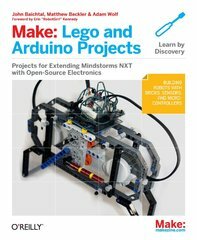 We wrote a book with John Baichtal that has a variety of example projects using Bricktronics, and overview chapters on Arduino, LEGO MINDSTORMS NXT, electronics, and other topics. The first project of that book is a random drawbot. If you take parts from the MINDSTORMS NXT 2.0 set, combine it with your Arduino and a Bricktronics shield, the Bricktronics Drawbot v1 Kit has everything you'll need to make a simple, first project. When you're done, you'll be able to take it apart and use the pieces to make any number of other creations. Build awesome mechatronic contraptions using LEGO Mindstorms NXT motors and sensors and your Arduino. Explore LEGO and Arduino through fun projects. All the extra parts you'll need to create a random drawbot! 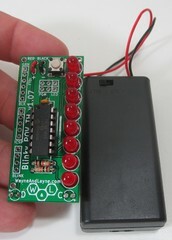 The Blinky POV Kit is our simplest kit. When you're done, you have a series of LEDs that can paint messages in the air when you swing it around. The messages can be updated using a computer display. It requires through-hole soldering, so you'll need a soldering iron, solder, and a clippers to cut off component legs. It has been designed to be as easy as possible to assemble. We have sold thousands of these, and built hundreds in workshops, and just about everyone has a great time. Already have a Blinky POV? 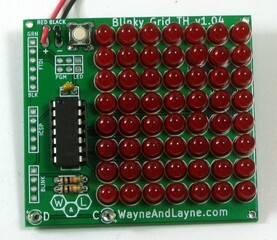 Try the Blinky Grid! It's as easy to solder, but takes longer to assemble due to the number of LEDs. The messages scroll across the display so you don't need to wave it around. It's also reprogrammable using the computer display. Surface mount technology (SMT) is the future. We have a guide on soldering SMT. 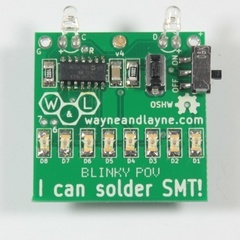 We have our Blinky Grid and Blinky POV available in SMT kits. They're designed to be as easy as possible, and are a great introduction for someone who wants to try it out. We sell both the kits and tools at the Wayne and Layne Store. Wave messages in the air and reprogram it by holding it up to your screen. Scroll messages and animations across an LED matrix, and reprogram it by holding it up to your screen. An excellent first SMT kit, this persistance of vision toy is reprogrammed by holding it up to your screen. Send us an email and let us know any details, and we can help you choose. We also sell gift certificates. You can print or email them immediately. Instructions for redeeming the gift certificate come with it, but it basically gives you a special code you (or the person you're giving it to) can use during checkout. Wayne and Layne, LLC and our products are not connected to or endorsed by the LEGO Group. LEGO, Mindstorms, and NXT are trademarks of the LEGO Group.